For gracious living in a spectacular and convenient setting, look no further than Emblem at Aloravita, a new community of gorgeously designed homes set against the stunning backdrop of the Golden Mountain Preserves in the high Sonoran Desert. Situated in desirable north Peoria, Arizona with an easy 30-minute commute to work and play in downtown Phoenix, the excellent location offers ample opportunities close at hand for outdoor desert and lake adventures, as well as the best of dining, shopping, entertainment, and nearby schools. 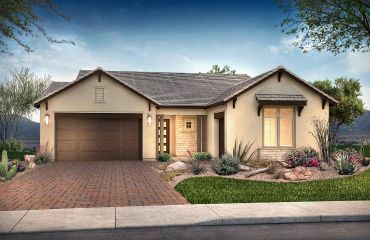 The elegant new homes of Emblem at Aloravita are located in an inviting Peoria neighborhood of 62 spacious homes with six different floorplans ranging from ~2,318 to ~3,505 square feet, and plenty of options to make your space your own.